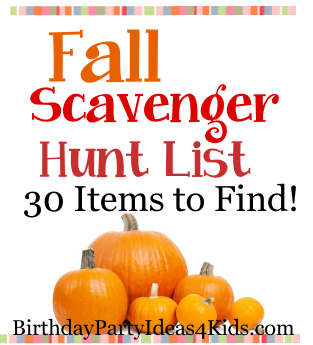 List of 30 Fun Fall / Autumn items to find during a Scavenger Hunt! Played by teams going door to door in a neighborhood and asking for items from their list. Once the items are collected the first team back within a certain time limit wins. Those who get back late are given a penalty - 1 item for every 5 minutes they are late.